Despite the considerable problems inherent in the present formal definition of the ampere, the unit can be measured with uncertainties low enough for almost every present purpose except the most highly advanced research. Doing so, however, typically means sidestepping the existing SI definition altogether. Fortunately, physics provides a handy alternative method in the form of Ohm’s law, formulated by German scientist Georg Ohm in 1827. It describes the proportional relationship among three closely associated electrical units: the ampere, the volt and the ohm. NIST also does measurement-science work on the ohm, the unit of resistance. Shown with the NIST quantum Hall resistance (QHR) system are (back row) Rand Elmquist, Marlin Kraft, Shamith Payagala (Univ. of MD, JQI) and Kwang Min Yu (KRISS, South Korea), and (front row) Dean Jarrett and George Jones. If these units are unfamiliar, it can be helpful to think of them as if they were aspects of a water system. Amperes correspond to the volume of water coming out of a pipe, volts to the water pressure, and ohms to the diameter of the pipe, which determines its resistance to flow. So, using Ohm’s law, if the voltage and resistance in a circuit are known, then the current can be determined using the formula. 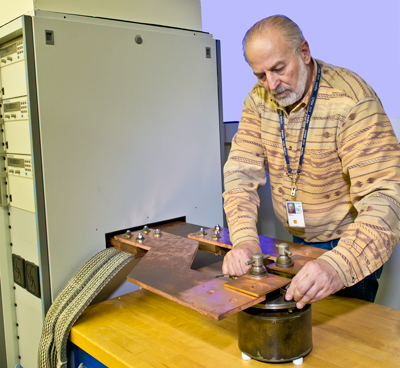 NIST's Marlin Kraft adjusts connections on a current shunt resistor that dates from 1899. At left is NIST's Direct Current 3000 Ampere Measurement System. Each of its three power supplies puts out a maximum of 1000 A. Of course, this appears to be doing things completely backwards. After all, in the SI, the seven base units, including the ampere, are meant to be used, in various mathematical combinations, to define 22 derived units―including the volt and the ohm. Yet, as a practical matter, the derived volt and ohm are used to measure the underlying ampere. There is an excellent reason for that: Both the volt and the ohm are known with far greater accuracy than the ampere. That’s because their values are based on constants derived from fundamental effects in the realm of quantum physics. As a result, the volt can be realized to an uncertainty of around 6 parts in a billion, and the ohm to 2 parts in 10 billion. 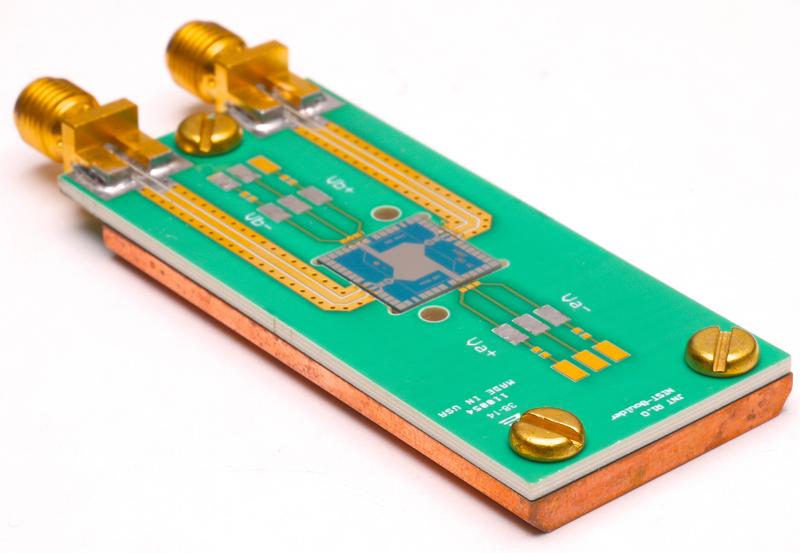 This quantum voltage noise source (QVNS) provides a fundamentally accurate voltage signal that can be compared to the voltage noise from electrons in a resistor. But there’s a catch. Ohm’s law doesn’t quite have the footing of, say, Newton’s laws of motion. That is, I = V/R can’t be deduced from other laws of physics. Instead, it represents the seemingly unvarying relationship among the three electrical quantities as measured by various techniques around the world during the past two centuries. (That sort of formula is called an “empirical” law because it is based entirely on observational evidence.) To date, it appears that Ohm’s law successfully describes measurements made with uncertainties in the range of parts per ten million. According to one report, it still holds in nanowires one atom tall and four atoms wide. So far, so good. But modern metrology will require ever lower uncertainties. Moreover, one longstanding goal of research on electrical units is to find out whether Ohm’s law continues to work all the way down to the quantum-mechanical scale of atoms and even smaller objects.